As of today we are making available three months of free use of the Joyent Cloud to owners of the XPS 13 developer edition. 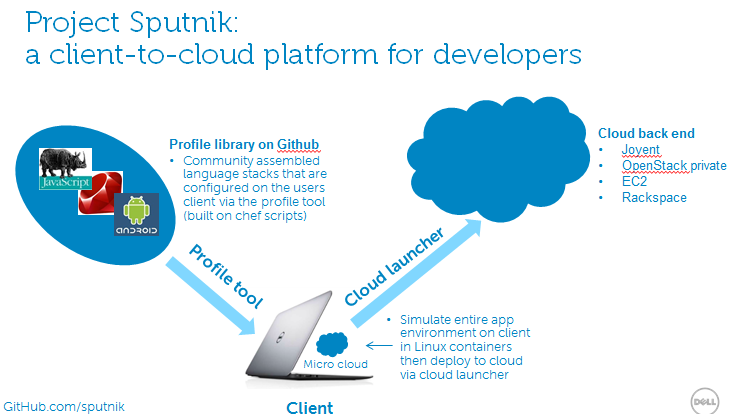 The idea behind Project Sputnik, has always been to provide a client-to-cloud platform for developers and today we are offering access to the Joyent Cloud to complete the solution. With the trial you get either two g3-standard-0.625-kvm instances running Ubuntu for 3 months or one g3-standard-1.75-kvm instance running Ubuntu for 3 months. We will be setting up a landing page in the next day or two provide elegant access to the Joyent Cloud but for those who want to get started right away you can simply follow the “How do I get Started” instructions below. We are kicking this off to begin with with 500 free accounts, first come first served. The cloud launcher creates a seamless link from the client to the cloud, to facilitate ongoing development of application environments. There is a Juju version of the launcher that currently comes with Sputnik and today we are announcing a version that Opscode has developed which uses spiceweasel as its underlying library. You can check out a demo of it here. We are also working to connect the chef version of the cloud launcher to the Joyent trial, more to come on that soon. The new consulting services provide assistance with assessing, building, operating and running cloud environments, and enable and accelerate enterprise OpenStack adoption. Now supports the newest version of Cloudera Enterprise. Updates allow customers to perform real-time SQL interactive queries and Hadoop-based batch processing, simplifying the process of querying data in Hadoop environments. Dell has released RAID and BIOS configuration capabilities to the Crowbar open source community. SUSE has integrated Crowbar functionality as part of SUSE Cloud to make OpenStack-based private cloud deployments seamless. Dell confirmed its commitment to further develop and support the Dasein open source project, as pioneered by recently acquired Enstratius. Find and run the “Install Joyent Public Could” in the launcher. Look for the big Joyent LOGO. Signup for a free trial account on the Joyent Public Cloud. How do I provision a new instance? Sign in to the Joyent portal and click the in the upper right portion of the screen. Once you’re there, the tool will walk you through the choice of datacenters, images, and instance types and sizes. You’ll have a chance to review the hourly and monthly cost of the instance, and provide a memorable name for the instance. Once you’ve decided on the type of instance that fits your project, click the button and the system will ask to confirm your request. The provisioning will start immediately, but may take a few seconds to complete. Clicking on the new named instance will show its assigned public IP address when provisioning is complete. You may SSH into the instance with ssh -l root <ip address>. How do I stop, resize or reboot instances? Shutting down, resizing or rebooting your instance can all be executed through the customer portal of Joyent. In addition, we’ve provided a script you can use to perform these steps within your instance. How do I install software on my instance? To install or update software on your instance, you’ll need to run commands as either the administrative or root user of your instance. For tips on how to run commands and installation processes, check out the pages on how to install software on your instance. How do I secure my instance? Joyent take cloud security very seriously and we have refined many processes to reduce risk and preserve the integrity of data managed in your instance. For a full list of security checks and processes, please visit the security center in our documentation. How do you manage your instance resource usage? One of strengths of Joyent is the ability to have full and detailed transparency of every aspect of your infrastructure and application. You can use Cloud Analytics to provide you real-time, diagnostic heatmaps of system behavior. In addition, using these tips here can provide you better control over optimizing the performance of your instance. How do you manage a database on your instance? Instances on Joyent can be pre-configured to run a wide range of databases and database services. Joyent supports: MySQL, Percona, Riak, MongoDB, as well as integration to database services from companies like, Cloudant or MongoLab. For big data projects, Joyent is an ideal platform for configuring and running a Hadoop cluster. Check out these guides on how to set up a database or configure your Hadoop cluster. How do you analyze performance of my instances? Joyent is the best cloud in the industry for monitoring the entire health of your stack. Using Cloud Analytics, you have the ability to examine, in real-time, the performance characteristics of every level of your application, and network. If you just want to perform server level monitoring, we’ve built integration with leading monitoring tools from New Relic and Nodefly as well. This entry was posted on Tuesday, July 23rd, 2013 at 11:59 am and is filed under Uncategorized. You can follow any responses to this entry through the RSS 2.0 feed. You can leave a response, or trackback from your own site. Potential Sputnik2er here. I’m a bit concerned that there may be Wifi issues with the xps dev 1080p edition. (This one, right? http://www.dell.com/ie/business/p/xps-13-linux/pd?refid=xps-13-linux ) Do you know if these have been sorted? Also, how does one update the BIOS (the regular Dell method seems to require DOS/Windows) Does something like FreeDOS work? This user seems to report that it does.